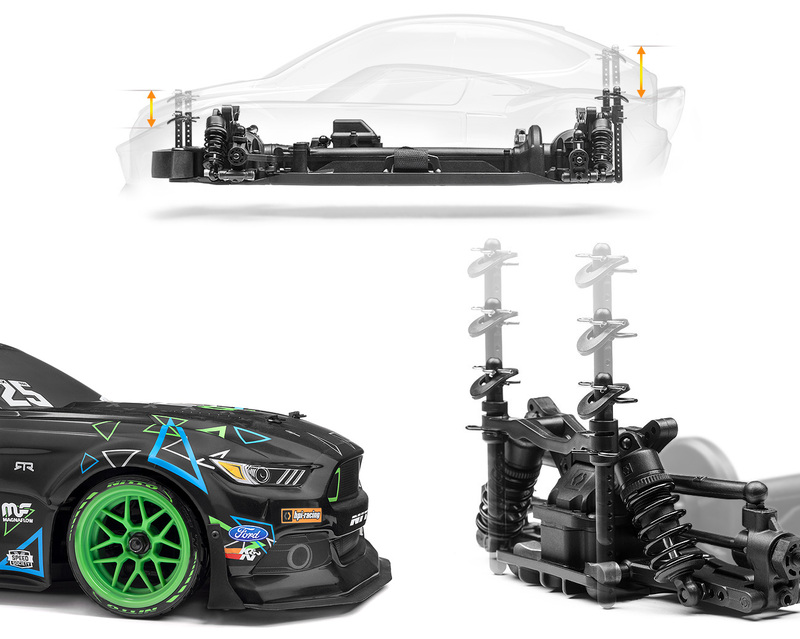 The RS4 Sport 3 line-up is expanding with Vaughn Gittin Jr's competition-spec Ford Mustang straight out of the RTR lab! Combining the fabulous driving of the RS4 Sport 3 with its 4WD drivetrain and replica Nitto tires is a no-brainer, and when topped with Vaughn's distinct black and silver livery, it's a one-of-a-kind combination! The super realistic Ford Mustang RTR Spec 5 body is coupled with a set of replica Tech 7 wheels wrapped with official Nitto RT05 replica tires for over the top scale realism! Under the hood, this 1/10th scale Mustang is equipped with the latest HPI Racing Touring Car chassis, the RS4 Sport 3. With full time shaft driven 4WD, a fully sealed drivetrain, waterproof 2.4 GHz electronics/radio gear, fully independent double wishbone suspension and adjustable oil filled shocks it's Ready to Rock in any condition. This RS4 Sport 3 Drift features the latest Ford Mustang styling, tuned and tweaked by drift champion Vaughn Gittin Jr. to become the awesome Ford Mustang RTR Spec 5. The car is also fitted with replica green RTR Tech 7 wheels wrapped with great-looking street tires, so it's ready to hit the streets right out of the box! The RTR Tech 7 wheel combines the classic mesh wheel design with a modern, angular look that is at once aggressive and functional, yet drenched with muscle car style. For full-size muscle car fans, this wheel is available ONLY for the Ford Mustang in a 20" size, however, they are perfectly replicated in 1/10th scale on the only officially authorized scale replica Ford Mustang RTR Spec 5 replica! Rounding out the package are official replicas of the actual tires that Vaughn Gittin Jr runs on his RTR Mustang Spec 5: the Nitto NT05! These low-profile drift-specific tires are made for high-performance, realistic drift action at 1/10th scale! With a super stiff, hard plastic construction, HPI drift tires are the ideal way to get drifting quickly and easily. The replica tread pattern looks fantastic, and only gets better with age as the tires wear down, just like the real thing! 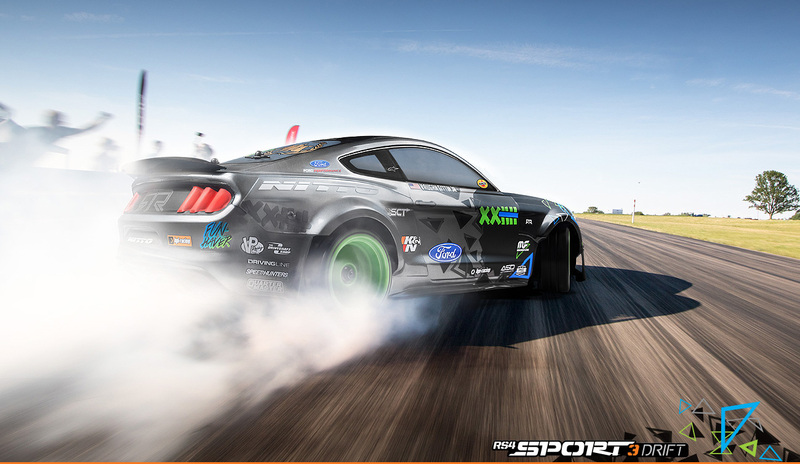 The Mustang RTR Spec 5 is the vision of World Champion pro drifter and lifelong Mustang mad man, Vaughn Gittin Jr! The Mustang RTR takes the best of multiple automotive cultures and meshes them together in a style that any automotive enthusiast can immediately appreciate. The Mustang RTR comes in the form of a dealer-installed package is currently available in select Ford dealerships around the world. The main chassis is formed from a single piece of reinforced plastic and features the drivetrain tunnel molded right down the middle, just like a real car. It's a step beyond any plastic tub chassis car available today. One of the ways we gave the RS4 Sport 3 Drift the best possible handling was to make sure all the components fit as low as possible in the chassis. This gives the car an amazingly low center of gravity for optimum cornering capabilities. The RS4 Sport 3 Drift features a versatile electronic speed controller that can be used with modern lithium-polymer (LiPo) or nickel-metal hydride (NiMH) batteries. Please note a LiPo adapter plug is not included, your model shop will be able to provide one. The RS4 Sport 3 Drift chassis can fit lithium-polymer (LiPo) and nickel-metal hydride (NiMH) packs of various sizes, including the extra-long 7-cell NiMH packs. Whatever your power requirements, it can hold it all! A thick hook-and-loop strap holds the pack securely in place, and a simple battery block screws into place to allow you to adjust the weight distribution forward or backward for extra steering or acceleration. The RS4 Sport 3 Drift features full-time four-wheel drive to give you the most control and precision on the road or track. All four wheels are driven by heavy duty gear differentials at the front and rear, just like a real car. The extra traction gives you increased acceleration and cornering control for maximum confidence and fun. The drivetrain of all the RS4 Sport 3 Drift models features the motor mounted longitudinally in the molded chassis, next to the long driveshaft that goes down the center of the car. The entire drivetrain, including the central driveshaft and gear diffs, is completely sealed to prevent dirt, rocks and debris from damaging or binding the drivetrain. The driveshaft, diffs and axles spin on ball bearings to maximize drivetrain efficiency. The central driveshaft that connects the front and rear differentials is easily accessed from underneath the chassis. This allows the drivetrain to be completely sealed to protect it from rocks and debris no matter where you may want to drive your car. Getting to the differentials for quick adjustments is a matter of removing just 4 screws - this allows you to pop out the diff and change the grease, check the gears or just give it a general service. Bevel gear differentials at each end of the car transfer power from the driveshaft to the dogbones and axles that drive each wheel. The all-metal construction allows the drivetrain to withstand powerful brushless motors for easy upgrading in the future. Rubber-sealed ball bearings support the differentials and each diff can be tuned independently by changing the diff grease. The suspension of the RS4 Sport 3 Drift uses the race-proven double-wishbone suspension design, similar to a full-scale modern race car. 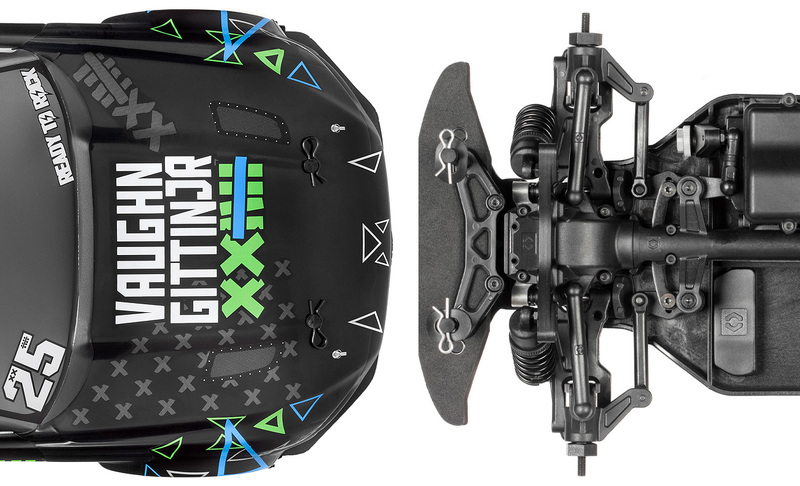 You'll be able to control the anti-squat and anti-dive of the front and rear arms using the standard pivot blocks, and the option parts allow you to adjust the sweep and toe angles. You'll also be able to easily change the roll center front and rear with the racing-style vertical ballstud mounting on both the inner and outer camber link mounts. Multiple shock mounting positions provide a full range of shock suspension angle adjustment to suit different road conditions. The RS4 Sport 3 Drift is fitted with a set composite coilover-style oil-filled shocks, just like what you'd see on a real race car! The fully adjustable shocks are fully tunable to provide the optimum chassis performance on a wide variety of road surfaces. The ride height is quickly adjustable by using the threaded shock collars. Further tuning adjustments are also possible by changing the springs and shock oil weight. The RS4 Sport 3 Drift front end uses the strong C-hub style suspension seen on the latest RC touring cars, with a vertical ball stud camber mount that lets you change the front end roll center - which is a critical racing adjustment that allows the RS4 Sport 3 Drift to be a step above other sport-level RC touring cars. The suspension arm also features multiple shock mounting holes for easy shock angle adjustment. The rear hub is fitted with a vertical ball stud style adjustment that allows easy adjustment of the rear roll center. Moving the ball stud up or down with the optional spacers changes the traction characteristics of the rear end as the car goes through the turns. The suspension arm also features 3 different shock mounting holes for easy shock angle adjustment. The performance tested adjustable double bell crank system provides optimum steering precision at all speeds. A metal drag link plate connects the cranks for extra durability, the additional drag link mounting positions also allows for Ackermann angle adjustments. Fitted to the HPI SS20WR water-resistant servo is an adjustable multipiece servo saver, which protects the servo from crash damage. In the event of a crash or collision, the front wheels usually take a big portion of the blow and transmits the impact directly to the steering servo. The strong spring-loaded cam action of the servo saver is designed to absorb this force and protect the servo from the impact! The cast aluminum cam-style motor mount holds the motor in place for a secure pinion/spur connection. Two screws hold the cam firmly in position on the mount, and cooling fins on the lateral support aid heat dissipation to keep the motor running as efficiently as possible. The built in rear end chassis diffuser element smooths out the air flow underneath the chassis for maximum aero efficiency. The RS4 Sport 3 Drift is fully fitted with a set of rubber-sealed ball bearings for maximum efficiency. The rubber seals keeps the dust away from the internals while the smooth precision bearings provides for optimum power delivery from the power source out into the driveline. To protect the front suspension, chassis and body from impacts big and small, an extra thick foam bumper is securely fastened to the front of the RS4 Sport 3 Drift. A huge variety of option bodies, wheels and tires from HPI lets you fully customize the style of your RS4 Sport 3 to suit your style. The adjustable height body mounts let you fit any 1/10th scale touring car body from HPI Racing on to the RS4 Sport 3 chassis. All you need to do is adjust the front and rear body mounts to allow the wheels and chassis elements to fit properly underneath the body. Body pins hold the mounts in place, and the multiple mounting hole positions allow you to fine-tune the exact body fitment. You can fit any 1/10th scale touring car body from HPI Racing onto the RS4 Sport 3, from hot hatches to supercars, pick-up trucks to supertouring racers. All you need to do is adjust the body mounts front and rear to allow the wheels to fit underneath the body properly. A simple system using body pins hold the mounts in place, and you can fine-tune the fit to get the exact ride height you want. 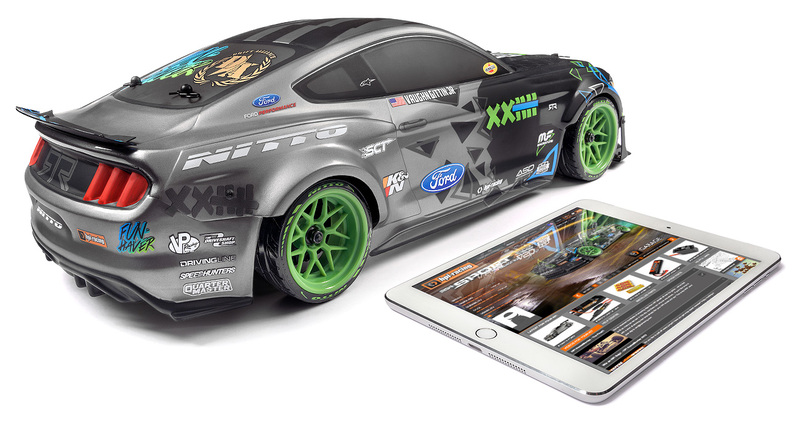 All HPI Racing kits include a detailed multi-language instruction manual. Exploded diagrams and extensive information about your RS4 Sport 3 Drift ensures that you have the knowhow when it comes to maintaining and upgrading your kit. You can also download a digital version of the manual to your personal electronic device and keep it with you for easy reference on the go. Once you've got your RS4 Sport 3 Drift, add it to your MYhpi garage to get direct information about what will make your car faster, more adjustable and easier to tune. Add your entire HPI collection to your MYhpi garage so you can directly access manuals, videos, tips and help for each of your HPI cars!